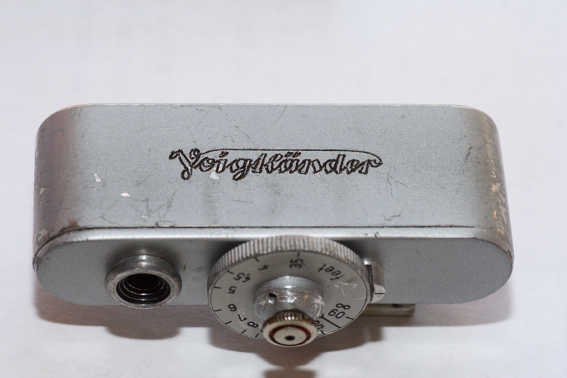 Voigtländer produced a small rangefinder as an accessory for their range of cameras in the 1950s. 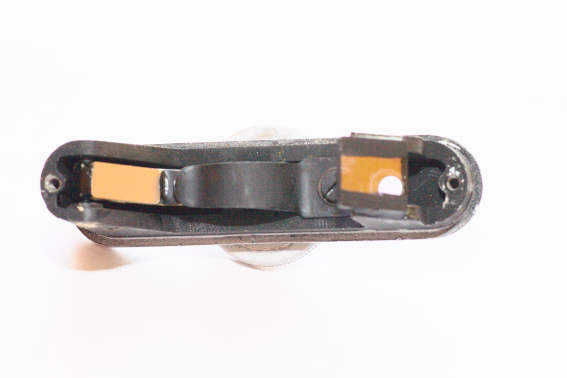 There were at least two versions of this as evidenced by the shoe connector. The rangefinder sits in the accessory shoe on top of the camera and is entirely independent of the camera. The rangefinder is die-cast in an aluminium alloy. Externally, there is one eyepiece and two objective lenses with a central knob/dial. 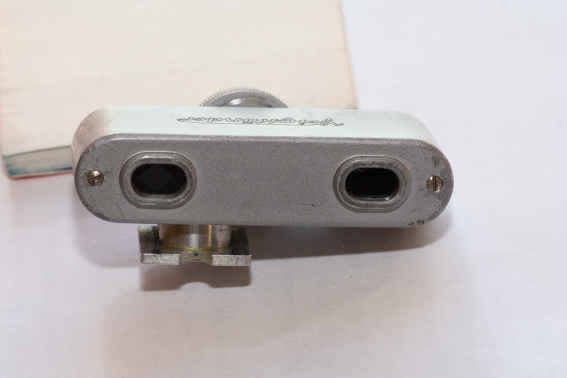 Internally, the eyepiece looks through a half-silvered mirror out through the left-hand objective lens. The light coming in the second, right-hand objective lens is reflected by a sloping mirror onto the left-hand half-silvered mirror and hence out through the eyepiece. The sloping mirror behind the right-hand objective lens is controlled via a cam by the external knob/dial. 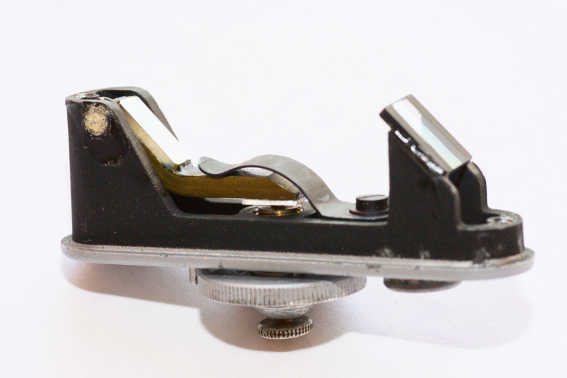 Turning the knob/dial alters the angle of the mirror and so alters the path of the light towards the eyepiece. In use, one looks through the eyepiece and sees two versions of the scene - one directly and one reflected through the second lens. Turning the central knob/dial moves the second image from side to side. When the images are superimposed, the correct distance can be read off the knob/dial. This is a very simple mechanism and there is little to go wrong with it. My rangefinder had a quantity of dust inside which was easily removed with a soft brush. I also gently polished the surface of both mirrors. Adjusting the rangefinder is also easy. You merely focus on an object at a known distance away and move the knob/dial on its spindle so that the correct distance is against the mark. 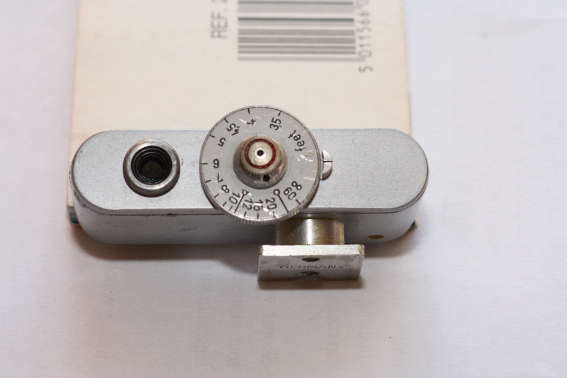 The only real fault is that the second, right-hand objective lens is rather small so the image reflected off the half-silvered mirror is relatively faint - half the light from from this objective passes through the half-silvered mirror and we only see an image that is half as bright as that from the left-hand objective lens. To help, the half-silvered mirror is tinted orange which makes the faint image easier to see.